Habit: Perennial herb 5--15 cm, from caudex with slender, rhizome-like branches (or taproot), +- appressed-short-hairy. Stem: ascending, unbranched, proximal 1/4 generally leafy, white-shiny or +- purple. Leaf: generally basal, 2--5 cm, 2--5 mm wide, narrowly oblanceolate, strigose; bases wider, hard, white-shiny, enclosing proximal stem. Inflorescence: head 1; involucre 5.5--9 mm, 13--18 mm diam; phyllaries +- equal, sparsely fine-spreading-hairy. Ray Flower: 15--35; corolla 7--15 mm, ray white to lavender, drying +- blue, not coiled or reflexed when dry. Fruit: pappus bristles 25--40. Chromosomes: 2n=18. 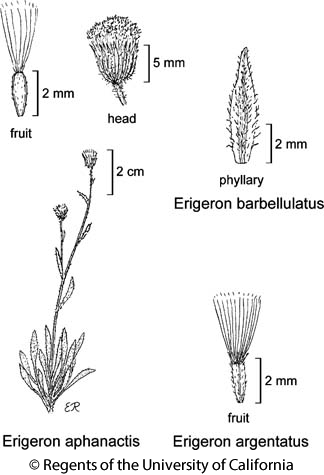 Citation for this treatment: David J. Keil & Guy L. Nesom 2012, Erigeron barbellulatus, in Jepson Flora Project (eds.) Jepson eFlora, http://ucjeps.berkeley.edu/eflora/eflora_display.php?tid=2630, accessed on April 23, 2019. CaRH, n&c SNH. Markers link to CCH specimen records. Yellow markers indicate records that may provide evidence for eFlora range revision or may have georeferencing or identification issues. Purple markers indicate specimens collected from a garden, greenhouse, or other non-wild location.